Brentford lost Alan Judge to a broken leg as they all but ended the play-off hopes of 10-man Ipswich Town. Midfielder Judge was carried off on a stretcher with his right leg in a brace after a second-minute tackle for which midfielder Luke Hyam was booked. Sam Saunders put the Bees ahead before Hyam was sent off in first-half injury time, reacting to Ryan Woods' tackle. Lasse Vibe scored twice in five minutes, with Liam Feeney's late strike for Ipswich a consolation. A Brentford statement read: "Alan has now been transferred to a London hospital where he will be managed by the leading lower limb consultant in the country. "The nature of his management and long-term prognosis cannot be speculated on at this time. "However, it should be stated that a full recovery is not in question." Mick McCarthy's Ipswich have now won only once in seven games, leaving them eight points behind sixth-placed Sheffield Wednesday. Brentford's win was their first at Portman Road, and first against Ipswich on any ground since 1955. Judge, who could now be a major doubt for the Republic of Ireland squad at this summer's European Championship, was given oxygen in a near 10-minute delay following Hyam's challenge. His replacement, Konstantin Kerschbaumer, set up the opener after half an hour, dispossessing Cole Skuse in midfield - Ipswich's claims for a free-kick were waived away - before passing to Saunders, who swept home. Ipswich's prospects were further dented in first-half injury time when Hyam reacted badly to Woods' tackle, and his push resulted in a red card. In the second half, Brentford made the extra man count, as Vibe scored his fourth and fifth goals in the past three games. The first came via a deft header from a Maxime Colin cross and the second four minutes later, Vibe winning the ball from Christophe Berra before slotting beyond Bartosz Bialkowski. Freddie Sears missed a golden chance to reduce the arrears when he blazed wide from close range, but the Tractor Boys halted a run of three games without scoring when Feeney finished calmly from David McGoldrick's pass for his first Ipswich goal. "Anything that could go wrong went wrong. I am disappointed that Dean felt it should be a red. I didn't even think it was a yellow. "But I do feel very sorry for Judgy. He is a great kid and a lovely player. The injury actually affected us more than them and especially Luke Hyam as his game is about winning tackles. "Luke apologised. He is sicker than any of us. I was going to take him off at half-time and in hindsight I should have taken him off sooner." "Alan Judge has gone to hospital and I am just hoping it is not as bad as I fear. I heard something but I am hoping it was a shinpad rather than the crack of a bone. It was a naughty tackle and should have been a red card. "We have had a tough run of injuries lately so to win again and score three goals again is pleasing. Even when it was eleven against eleven, we always looked the most likely to score. "I am proud of my players for keeping their discipline and then creating good opportunities in the second half." Match ends, Ipswich Town 1, Brentford 3. 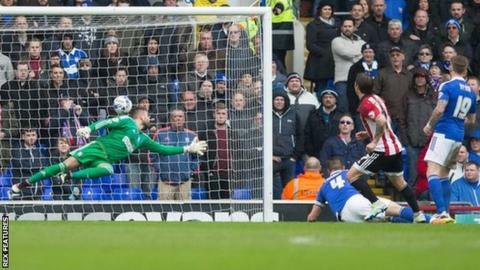 Second Half ends, Ipswich Town 1, Brentford 3. Attempt missed. Jake Bidwell (Brentford) left footed shot from outside the box is high and wide to the right. Attempt blocked. Lasse Vibe (Brentford) left footed shot from outside the box is blocked. Assisted by Ryan Woods. Goal! Ipswich Town 1, Brentford 3. Liam Feeney (Ipswich Town) left footed shot from a difficult angle on the left to the centre of the goal. Assisted by David McGoldrick. Attempt missed. David McGoldrick (Ipswich Town) right footed shot from outside the box is high and wide to the right. Assisted by Liam Feeney following a set piece situation. Liam Feeney (Ipswich Town) wins a free kick in the attacking half. Attempt missed. Liam Feeney (Ipswich Town) right footed shot from the centre of the box is high and wide to the right. Assisted by David McGoldrick. Attempt missed. Freddie Sears (Ipswich Town) right footed shot from the centre of the box is high and wide to the right. Assisted by Jonas Knudsen with a through ball. Attempt missed. David McGoldrick (Ipswich Town) right footed shot from the centre of the box is high and wide to the right following a set piece situation. Attempt missed. Lasse Vibe (Brentford) right footed shot from outside the box is close, but misses to the right. Assisted by Konstantin Kerschbaumer following a fast break. Corner, Ipswich Town. Conceded by Akaki Gogia. Offside, Ipswich Town. Freddie Sears tries a through ball, but David McGoldrick is caught offside. Attempt saved. Konstantin Kerschbaumer (Brentford) left footed shot from the centre of the box is saved in the bottom right corner. Assisted by Lasse Vibe. Attempt blocked. David McGoldrick (Ipswich Town) header from the centre of the box is blocked. Assisted by Liam Feeney with a cross. Attempt blocked. Freddie Sears (Ipswich Town) right footed shot from outside the box is blocked. Assisted by Jonas Knudsen. Substitution, Ipswich Town. Liam Feeney replaces Luke Varney. Substitution, Brentford. Akaki Gogia replaces Sergi Canos because of an injury. Attempt saved. Lasse Vibe (Brentford) right footed shot from the right side of the six yard box is saved in the bottom right corner. Attempt saved. Sam Saunders (Brentford) right footed shot from outside the box is saved in the bottom left corner. Assisted by Ryan Woods. Corner, Ipswich Town. Conceded by Maxime Colin. Attempt blocked. Freddie Sears (Ipswich Town) right footed shot from the centre of the box is blocked. Assisted by Jonas Knudsen with a cross. Goal! Ipswich Town 0, Brentford 3. Lasse Vibe (Brentford) right footed shot from the right side of the box to the bottom left corner. Goal! Ipswich Town 0, Brentford 2. Lasse Vibe (Brentford) header from the centre of the box to the bottom left corner. Assisted by Maxime Colin with a cross. Attempt missed. Lasse Vibe (Brentford) header from the centre of the box is high and wide to the right.